The lithium–air battery (Li–air) is a metal–air electrochemical cell or battery chemistry that uses oxidation of lithium at the anode and reduction of oxygen at the cathode to induce a current flow. Pairing lithium and ambient oxygen can theoretically lead to electrochemical cells with the highest possible specific energy. Indeed, the theoretical specific energy of a non-aqueous Li–air battery, in the charged state with Li2O2 product and excluding the oxygen mass, is ~40.1 MJ/kg. This is comparable to the theoretical specific energy of gasoline, ~46.8 MJ/kg. In practice, Li–air batteries with a specific energy of ~6.12 MJ/kg at the cell level have been demonstrated. This is about 5 times greater than that of a commercial lithium-ion battery, and is sufficient to run a 2,000 kg EV for ~500 km (310 miles) on one charge using 60 kg of batteries. However, the practical power and life-cycle of Li–air batteries need significant improvements before they can find a market niche. Significant electrolyte advances are needed to develop a commercial implementation. Four approaches are active: aprotic, aqueous, solid state and mixed aqueous–aprotic. Metal–air batteries, specifically zinc–air, have received attention due to potentially high energy densities. The theoretical specific energy densities for metal–air batteries are higher than for ion-based methods. Lithium–air batteries can theoretically achieve 3840 mA·h/g. A major market driver for batteries is the automotive sector. The energy density of gasoline is approximately 13 kW·h/kg, which corresponds to 1.7 kW·h/kg of energy provided to the wheels after losses. Theoretically, lithium–air can achieve 12 kW·h/kg (43.2 MJ/kg) excluding the oxygen mass. Accounting for the weight of the full battery pack (casing, air channels, lithium substrate), while lithium alone is very light, the energy density is considerably lower. A Li–air battery potentially had 5–15 times the specific energy of a Li-ion battery as of 2016[update]. Originally proposed in the 1970s as a possible power source for battery electric vehicles, and hybrid electric vehicles, Li–air batteries recaptured scientific interest late in the first decade of the 2000s due to advances in materials science. Although the idea of a lithium–air battery was around long before 1996, the risk-to-benefit ratio was perceived as too high to pursue. Indeed, both the negative (lithium metal) and the positive (air or oxygen electrodes) are the reasons why, respectively, rechargeable lithium-metal batteries failed to reach the market in the 1970s (the lithium-ion battery in a mobile device uses a LiC6-graphite compound on the negative electrode, not a lithium metal). Nevertheless, due to a perceived lack of other alternatives to high specific energy rechargeable batteries, and due to some initially promising results from academic labs, both the number of patents and of free-domain publications related to lithium–oxygen (including Li–air) batteries began growing exponentially in 2006. The drop in the apparent patent numbers since 2015 is due to a delay between the priority and publication dates. For example, the 30-month delay between a Provisional application filing and the publication of a Patent Cooperation Treaty application. However, the technical difficulties facing such batteries, especially considering that they must be rechargeable for most applications, are daunting. 2 at the cathode. Both non-aqueous (with Li2O2 or LiO2 as the discharge products) and aqueous (LiOH as the discharge product) Li-O2 batteries have been considered. The aqueous battery requires a protective layer on the negative electrode to keep the Li metal from reacting with water. Lithium has high specific capacity (3840 mAh/g) compared with other metal–air battery materials (820 mAh/g for Zinc, 2965 mAh/g for aluminium). Several issues affect such cells. The main challenge in anode development is preventing the anode from reacting with the electrolyte. Alternatives include new electrolyte materials or redesigning the interface between electrolyte and anode. Lithium anodes risk dendritic lithium deposits, decreasing energy capacity or triggering a short circuit. The effects of pore size and pore size distribution remain poorly understood. Upon charging/discharging in aprotic cells, layers of lithium salts precipitate onto the anode, eventually covering it and creating a barrier between the lithium and electrolyte. This barrier initially prevents corrosion, but eventually inhibits the reaction kinetics between the anode and the electrolyte. This chemical change of the solid–electrolyte interface (SEI) results in varying chemical composition across the surface, causing the current to vary accordingly. The uneven current distribution furthers branching dendrite growth and typically leads to a short circuit between the anode and cathode. In aqueous cells problems at the SEI stem from the high reactivity of lithium metal with water. Formation of a Li-ion protective layer using di- and triblock copolymer electrolytes. According to Seeo, Inc., such electrolytes (e.g., polystyrene with the high Li-ion conductivity of a soft polymer segment, such as a poly(ethylene oxide (PEO) and Li-salt mixture) ) combine the mechanical stability of a hard polymer segment with the high ionic conductivity of the soft polymer–lithium-salt mixture. The hardness inhibits dendrite shorts via mechanical blocking. 3N, can be inserted between the ceramic and metal. This ceramic-based SEI inhibits the formation of dendrites and protects the lithium metal from atmospheric contamination. At the cathode during charge, oxygen donates electrons to the lithium via reduction. Mesoporous carbon has been used as a cathode substrate with metal catalysts that enhance reduction kinetics and increase the cathode's specific capacity. Manganese, cobalt, ruthenium, platinum, silver, or a mixture of cobalt and manganese are potential metal catalysts. Under some circumstances manganese-catalyzed cathodes performed best, with a specific capacity of 3137 mA·H/g carbon and cobalt-catalyzed cathodes performed second best, with a specific capacity of 2414 mA·H/g carbon. Based on the first pore-scale modeling of lithium–air batteries, the micro-structure of the cathode significantly affects battery capacity in both non-pore-blocking and pore-blocking regimes. Most Li–air battery limits are at the cathode, which is also the source of its potential advantages. Atmospheric oxygen must be present at the cathode, but contaminants such as water vapor can damage it. Incomplete discharge due to blockage of the porous carbon cathode with discharge products such as lithium peroxide (in aprotic designs) is the most serious. Several modes of precipitates were modeled. A parameter, Da, was defined to measure the variations of temperature, species concentration and potentials. 2O, which is irreversible with respect to lithium. Li–air performance is limited by the efficiency of the reaction at the cathode, because most of the voltage drop occurs there. Multiple chemistries have been assessed, distinguished by their electrolyte. This discussion focuses on aprotic and aqueous electrolytes as solid-state electrochemistry is poorly understood. Lithium oxides are insoluble in aprotic electrolytes, which leads to cathode clogging. 2 nanowire array cathode augmented by a genetically modified M13 bacteriophage virus offers two to three times the energy density of 2015-era lithium-ion batteries. The virus increased the size of the nanowire array, which is about 80 nm across. The resulting wires had a spiked surface. Spikes create more surface area to host reaction sites. The viral process creates a cross-linked 3D structure, rather than isolated wires, stabilizing the electrode. The viral process is water-based and takes place at room temperature. Efforts in Li–air batteries have focused on four electrolytes: aqueous acidic, aqueous alkaline, non-aqueous protic, and aprotic. An aqueous Li–air battery consists of a lithium metal anode, an aqueous electrolyte and a porous carbon cathode. The aqueous electrolyte combines lithium salts dissolved in water. It avoids the issue of cathode clogging because the reaction products are water-soluble. The aqueous design has a higher practical discharge potential than its aprotic counterpart. However, lithium metal reacts violently with water and thus the aqueous design requires a solid electrolyte interface between the lithium and electrolyte. Commonly, a lithium-conducting ceramic or glass is used, but conductivity are generally low (on the order of 10−3 S/cm at ambient temperatures). A conjugate base is involved in the reaction. The theoretical maximal Li–air cell specific energy and energy density are 1400 W·h/kg and 1680 W·h/l, respectively. Water molecules are involved in the redox reactions at the air cathode. The theoretical maximal Li–air cell specific energy and energy density are 1300 W·h/kg and 1520 W·h/l, respectively. 2 and/or LiOH without causing the cathode pores to block and employ suitable catalysts to make the electrochemical reactions energetically practical. Dual pore system materials offer the most promising energy capacity. The first pore system serves as an oxidation product store. The second pore system serves as oxygen transport. Non-aqueous Li–air batteries were demonstrated first. They usually use mixed ethylene carbonate+ propylene carbonate solvents with LiPF6 or Li bis-sulfonimide salts like conventional Li-ion batteries, however, with a gelled rather than liquid electrolyte. The voltage difference upon constant current charge and discharge is usually between 1.3 and 1.8 V (with an OCP of ca. 4.2 V) even at such ridiculously low currents as 0.01–0.5 mA/cm² and 50–500 mA/g of C on the positive electrode (see Figure 2), However, the carbonate solvents evaporate and get oxidized due to a high overvoltage upon charge. Other solvents, such as end-capped glymes, DMSO, dimethylacetamide, and ionic liquids, have been considered. The carbon cathode gets oxidized above +3.5 V v Li during charge, forming Li2CO3, which leads to an irreversible capacity loss. 2 produced at the cathode is generally insoluble in the organic electrolyte, leading to buildup along the cathode/electrolyte interface. This makes cathodes in aprotic batteries prone to clogging and volume expansion that progressively reduces conductivity and degrades battery performance. Another issue is that organic electrolytes are flammable and can ignite if the cell is damaged. 2) and can be used as the final discharge product, potentially with an improved cycle life albeit with a lower specific energy (a little heavier battery weight). Indeed, it was shown that under certain conditions, the superoxide can be stable on the scale of 20–70 h at room temperature. An irreversible capacity loss upon disproportionation of LiO2 in the charged battery was not addressed. 2 phases). This makes the practical specific energy of Li-O2 batteries significantly smaller than the reagent-level calculation predicts. It seems that these parameters have reached their limits, and further improvement is expected only from alternative methods. The aqueous–aprotic or mixed Li–air battery design attempts to unite advantages of the aprotic and aqueous battery designs. The common feature of hybrid designs is a two-part (one part aqueous and one part aprotic) electrolyte connected by a lithium-conducting membrane. 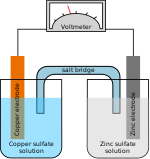 The anode abuts the aprotic side while the cathode is in contact with the aqueous side. A lithium-conducting ceramic is typically employed as the membrane joining the two electrolytes. The use of a solid electrolyte (see Fig. 3) is one such alternative approaches that allows for a combination of a lithium metal anode with an aqueous cathode. Ceramic solid electrolytes (CSEs) of the NASICON family (e.g., Li1−xAxM2−x(PO4)3 with A ∈ [Al, Sc, Y] and M ∈ [Ti, Ge]) has been studied. Compatible with water at alkaline pH and having a large electrochemical window (see Figs. 3,4), their low Li+ ion conductivity near room temperature (< 0.005 S/cm, >85 Ω cm2) makes them unsuitable for automotive and stationary energy storage applications that demand low cost (i.e., operating current densities over 100 mA/cm2). Further, both Ti and Ge are reduced by metallic Li, and an intermediate layer between the ceramic electrode and the negative electrode is required. In contrast, solid polymer electrolytes (SPEs) can provide a higher conductivity at the expense of a faster crossover of water and of other small molecules that are reactive toward metallic Li. Among the more exotic membranes considered for Li-O2 batteries is single-crystal silicon. 2). The result offered energy efficiency of 93 percent (voltage gap of .2) and cycled more than 2,000 times with little impact on output. However, the design required pure oxygen, rather than ambient air. A solid-state battery design is attractive for its safety, eliminating the chance of ignition from rupture. Current solid-state Li–air batteries use a lithium anode, a ceramic, glass, or glass-ceramic electrolyte, and a porous carbon cathode. The anode and cathode are typically separated from the electrolyte by polymer–ceramic composites that enhance charge transfer at the anode and electrochemically couple the cathode to the electrolyte. The polymer–ceramic composites reduce overall impedance. The main drawback of the solid-state battery design is the low conductivity of most glass-ceramic electrolytes. The ionic conductivity of current lithium fast ion conductors is lower than liquid electrolyte alternatives. As of 2013, many challenges confronted designers. Most Li–air battery limits are at the cathode, which is also the source of its potential advantages. Incomplete discharge due to blockage of the porous carbon cathode with discharge products such as lithium peroxide (in aprotic designs) is the most serious. Several modes of precipitates were modeled. A parameter, Da, was defined to measure the variations of temperature, species concentration and potentials. The effects of pore size and pore size distribution remain poorly understood. Atmospheric oxygen must be present at the cathode, but contaminants such as water vapor can damage it. In 2017 cell designs, the charge overpotential is much higher than the discharge overpotential. Significant charge overpotential indicates the presence of secondary reactions. Thus, electric efficiency is only around 65%. 2, and the mechanism of improvement is known as surface oxygen redox providing abundant initial growth sites for lithium peroxide. It is also reported that catalysts may alter the structure of oxide deposits. Significant drops in cell capacity with increasing discharge rates are another issue. The decrease in cell capacity is attributed to kinetic charge transfer limits. Since the anodic reaction occurs very quickly, the charge transfer limits are thought to occur at the cathode. Long-term battery operation requires chemical stability of all cell components. Current cell designs show poor resistance to oxidation by reaction products and intermediates. Many aqueous electrolytes are volatile and can evaporate over time. Stability is hampered in general by parasitic chemical reactions, for instance those involving reactive oxygen. Li–air cells are of interest for electric vehicles, because of their high theoretical specific and volumetric energy density, comparable to petrol. Electric motors provide high efficiency (95% compared to 35% for an internal combustion engine). Li–air cells could offer range equivalent to today's vehicles with a battery pack one-third the size of standard fuel tanks assuming the balance of plant required to maintain the battery was of negligible mass or volume. In 2014, researchers announced a hybrid solar cell-battery. Up to 20% of the energy produced by conventional solar cells is lost as it travels to and charges a battery. The hybrid stores nearly 100% of the energy produced. One version of the hybrid used a potassium-ion battery using potassium–air. It offered higher energy density than conventional Li-ion batteries, cost less and avoided toxic byproducts. The latest device essentially substituted lithium for potassium. The solar cell used a mesh made from microscopic rods of titanium dioxide to allow the needed oxygen to pass through. Captured sunlight produced electrons that decompose lithium peroxide into lithium ions, thereby charging the battery. During discharge, oxygen from air replenished the lithium peroxide. ^ Badwal, Sukhvinder P. S.; Giddey, Sarbjit S.; Munnings, Christopher; Bhatt, Anand I.; Hollenkamp, Anthony F. (24 September 2014). "Emerging electrochemical energy conversion and storage technologies". Frontiers in Chemistry. 2: 79. doi:10.3389/fchem.2014.00079. PMC 4174133. PMID 25309898. ^ Christensen, J.; Albertus, P.; Sanchez-Carrera, R. S.; Lohmann, T.; Kozinsky, B.; Liedtke, R.; Ahmed, J.; Kojic, A. (2012). "A Critical Review of Li–Air Batteries". Journal of the Electrochemical Society. 159 (2): R1. doi:10.1149/2.086202jes. ^ a b c Younesi, Reza; Veith, Gabriel M.; Johansson, Patrik; Edström, Kristina; Vegge, Tejs (2015). "Lithium salts for advanced lithium batteries: Li–metal, Li–O 2, and Li–S". Energy Environ. Sci. 8 (7): 1905–1922. doi:10.1039/c5ee01215e. ^ a b c Ogasawara, T.; Débart, A. L.; Holzapfel, M.; Novák, P.; Bruce, P. G. (2006). "Rechargeable Li2O2Electrode for Lithium Batteries". Journal of the American Chemical Society. 128 (4): 1390–1393. doi:10.1021/ja056811q. PMID 16433559. 2 Electrode in Rechargeable Lithium Batteries". Angew. Chem. 47 (24): 4521–4524. doi:10.1002/anie.200705648. PMID 18461594. ^ a b c d He, P.; Wang, Y.; Zhou, H. (2010). "A Li–air fuel cell with recycle aqueous electrolyte for improved stability". Electrochemistry Communications. 12 (12): 1686–1689. doi:10.1016/j.elecom.2010.09.025. ^ a b c d Kumar, B.; Kumar, J.; Leese, R.; Fellner, J. P.; Rodrigues, S. J.; Abraham, K. M. (2010). "A Solid-State, Rechargeable, Long Cycle Life Lithium–Air Battery". Journal of the Electrochemical Society. 157: A50. doi:10.1149/1.3256129. ^ Wang, Yonggang (2010). "A lithium–air battery with a potential to continuously reduce O2 from air for delivering energy". Journal of Power Sources. 195 (1): 358–361. doi:10.1016/j.jpowsour.2009.06.109. ^ a b Kumar, B.; Kumar, J. (2010). "Cathodes for Solid-State Lithium–Oxygen Cells: Roles of Nasicon Glass-Ceramics". Journal of the Electrochemical Society. 157 (5): A611. doi:10.1149/1.3356988. ^ a b c d e Girishkumar, G.; McCloskey, B.; Luntz, A. C.; Swanson, S.; Wilcke, W. (2010). "Lithium−Air Battery: Promise and Challenges". The Journal of Physical Chemistry Letters. 1 (14): 2193–2203. doi:10.1021/jz1005384. ^ a b Ed. Jurgen O. Besenhard, Handbook of Battery Materials, New Your, Wiley-VCH, 1999, ISBN 3-527-29469-4. ^ a b Xu, K. (2004). "Nonaqueous Liquid Electrolytes for Lithium-Based Rechargeable Batteries". Chemical Reviews. 104 (10): 4303–417. doi:10.1021/cr030203g. PMID 15669157. ^ Winter, M.; Brodd, R. J. (2004). "What Are Batteries, Fuel Cells, and Supercapacitors?". Chemical Reviews. 104 (10): 4245–4269. doi:10.1021/cr020730k. PMID 15669155. ^ a b c d e f g Kraytsberg, A.; Ein-Eli, Y. (2011). "Review on Li–air batteries—Opportunities, limitations and perspective". Journal of Power Sources. 196 (3): 886–893. doi:10.1016/j.jpowsour.2010.09.031. ^ Tikekar, Mukul D.; Choudhury, Snehashis; Tu, Zhengyuan; Archer, Lynden A. (2016-09-08). "Design principles for electrolytes and interfaces for stable lithium-metal batteries". Nature Energy. 1 (9): 16114. doi:10.1038/nenergy.2016.114. ISSN 2058-7546. ^ Aurbach, D. (2000). "Review of selected electrode–solution interactions which determine the performance of Li and Li ion batteries". Journal of Power Sources. 89 (2): 206–218. doi:10.1016/S0378-7753(00)00431-6. ^ Whittingham, M. S. (1976). "Electrical Energy Storage and Intercalation Chemistry". Science. 192 (4244): 1126–1127. doi:10.1126/science.192.4244.1126. PMID 17748676. ^ a b c Kowalczk, I.; Read, J.; Salomon, M. (2007). "Li–air batteries: A classic example of limitations owing to solubilities". Pure and Applied Chemistry. 79 (5): 851. doi:10.1351/pac200779050851. ^ a b Singh, M.; Gur, I.; Balsara, N. P. (2009). "Solid Electrolyte Material Manufacturable by Polymer Processing Methods", U.S. Patent Application #12271829. ^ Bates, J. (2000). "Thin-film lithium and lithium-ion batteries". Solid State Ionics (Submitted manuscript). 135 (1–4): 33–37. doi:10.1016/S0167-2738(00)00327-1. ^ Visco, S.; Nimonm, Y. (2010). "Active Metal/Aqueous Electrochemical Cells and Systems", U.S.Patent #7645543. ^ Abraham, K. M. (1996). "A Polymer Electrolyte-Based Rechargeable Lithium/Oxygen Battery". Journal of the Electrochemical Society. 143: 1–5. doi:10.1149/1.1836378. ^ a b Y. Wang, Modeling Discharge Deposit Formation and Its Effect on Lithium–air Battery Performance, Electrochimica Acta 75 (2012) 239–246. ^ a b Y. Wang and S. C. Cho, Analysis of Air Cathode Performance for Lithium–air Batteries, Journal of the Electrochemical Society, 160 (10) A1-A9 (2013). ^ a b c Lu, Yi-Chun (2010). "The Influence of Catalysts on Discharge and Charge Voltages of Rechargeable Li–Oxygen Batteries". Electrochemical and Solid-State Letters. 13 (6): A69. doi:10.1149/1.3363047. ^ Read, J. (2002). "Characterization of the Lithium/Oxygen Organic Electrolyte Battery". Journal of the Electrochemical Society. 149 (9): A1190–A1196. doi:10.1149/1.1498256. ^ "Lithium–air batteries go viral for greater durability and performance". gizmag.com. ^ Oh, D.; Qi, J.; Lu, Y. C.; Zhang, Y.; Shao-Horn, Y.; Belcher, A. M. (2013). "Biologically enhanced cathode design for improved capacity and cycle life for lithium–oxygen batteries". Nature Communications. 4: 2756. doi:10.1038/ncomms3756. PMC 3930201. PMID 24220635. ^ Williford, R. E.; Zhang, J. G. (2009). "Air electrode design for sustained high power operation of Li/air batteries". Journal of Power Sources. 194 (2): 1164–1170. doi:10.1016/j.jpowsour.2009.06.005. ^ Abraham and Jiang 1996. ^ Balaish, Kraytsberg et al. 2014. ^ McCloskey, Burke, et al. 2015. ^ Liu, Xu, et al. 2016. ^ a b Lu & Amine 2013. ^ Balaish & Kraytsberg et al. 2014. ^ a b c Imanishi, Matsui & et al. 2014. ^ Li, Xianglin; Faghri, Amir (2012). "Optimization of the Cathode Structure of Lithium–Air Batteries Based on a Two-Dimensional, Transient, Non-Isothermal Model". Journal of the Electrochemical Society. 159 (10): A1747–A1754. doi:10.1149/2.043210jes. ^ a b Balaish, Kraytsberg & et al. 2014. ^ McCloskey, Burke & et al. 2015. ^ a b Zhai, Lau & et al. 2015. ^ Lu, Lee & et al. 2016. ^ a b Lu, Xu & et al. 2010. ^ Shi, Xu & et al. 2015. ^ Delacey, Lynda (November 19, 2015). "More hurdles jumped on path to a practical lithium–air battery". www.gizmag.com. Retrieved 2015-12-03. ^ Liu, Tao; Leskes, Michal; Yu, Wanjing; Moore, Amy J.; Zhou, Lina; Bayley, Paul M.; Kim, Gunwoo; Grey, Clare P. (2015-10-30). "Cycling Li-O2 batteries via LiOH formation and decomposition". Science. 350 (6260): 530–533. arXiv:1805.03042. doi:10.1126/science.aac7730. ISSN 0036-8075. PMID 26516278. ^ "New design points a path to the 'ultimate' battery". phys.org. October 29, 2015. Retrieved 2015-12-03. ^ Zhang, T.; Imanishi, N.; Shimonishi, Y.; Hirano, A.; Takeda, Y.; Yamamoto, O.; Sammes, N. (2010). "A novel high energy density rechargeable lithium/air battery". Chemical Communications (Submitted manuscript). 46 (10): 1661–1663. doi:10.1039/b920012f. PMID 20177608. ^ Zheng, Yongping; Song, Kyeongse; Jung, Jaepyeong; Li, Chenzhe; Heo, Yoon-Uk; Park, Min-Sik; Cho, Maenghyo; Kang, Yong-Mook; Cho, Kyeongjae (May 2015). "Critical Descriptor for the Rational Design of Oxide-Based Catalysts in Rechargeable Li–O Batteries: Surface Oxygen Density". Chemistry of Materials. 27 (9): 3243–3249. doi:10.1021/acs.chemmater.5b00056. ^ Darren Quick (5 April 2010). "Lithium–air batteries offer three times the energy density". Retrieved 5 Oct 2011. ^ Shimonishi, Y.; Zhang, T.; Imanishi, N.; Im, D.; Lee, D. J.; Hirano, A.; Takeda, Y.; Yamamoto, O.; Sammes, N. (2011). "A study on lithium/air secondary batteries—Stability of the NASICON-type lithium ion conducting solid electrolyte in alkaline aqueous solutions". Journal of Power Sources. 196 (11): 5128–5132. doi:10.1016/j.jpowsour.2011.02.023. ^ a b Dimberuon, Peniel M. (October 28, 2014). "New Hybrid Solar Cell Battery Takes Aim at Solar Power's Energy Storage Problem". Singularity Hub. Retrieved 17 December 2016. A quasi-solid-state rechargeable lithium–oxygen battery based on a gel polymer electrolyte with an ionic liquid.